There’s something special about a steaming cup of rich hot chocolate on a cold winter’s day that wraps you in warmth and comfort like a cozy blanket or a mother’s hug. Sitting by the fire with loved ones, listening to The Night Before Christmas being read to little children while sipping on delicious cocoa are the kind of moments that make the holiday season so memorable, and why we look forward to this time together all year long. This year, bring your family even closer over a cup of hot cocoa with a DIY Hot Cocoa Bar, similar to those found in each of our Martin Resorts hotel lobbies. With these tips, everyone will be craving a refill, including St. Nick himself! Don’t let all the bells and whistles of toppings and décor distract you from the main event, the drink itself. 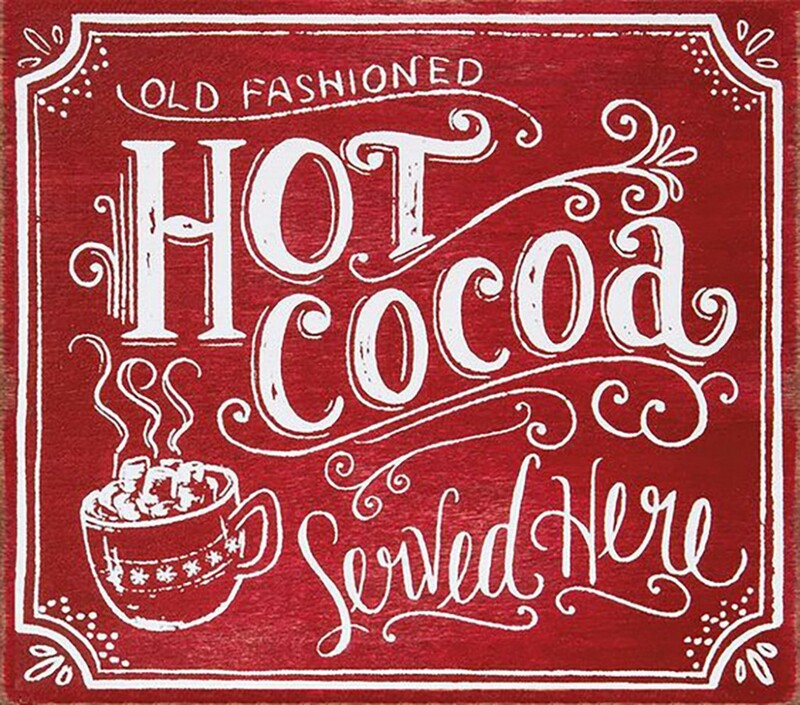 In order to have a stand-out hot chocolate bar, you first must concoct the perfect cup of cocoa to serve as your base. Luckily, with just a few tricks, a pinch here, and a dash there—tweaking your cocoa flavors is simple & fun! Offer your guests a variety of flavors to choose from for a truly customizable cocoa bar experience. 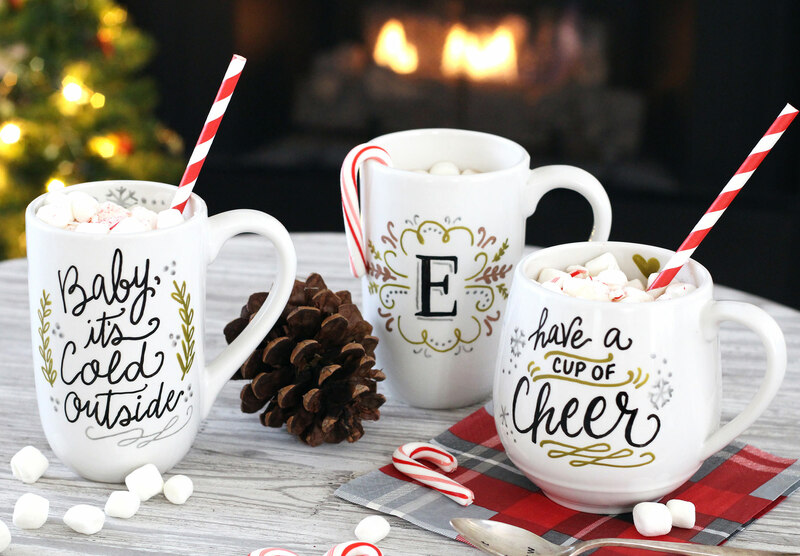 From Nutella Hot Chocolate, Cinnamon Hot Chocolate, and Mocha Hot Chocolate to Peppermint Hot Chocolate or even Pumpkin Spice White Hot Chocolate, the options are endless! 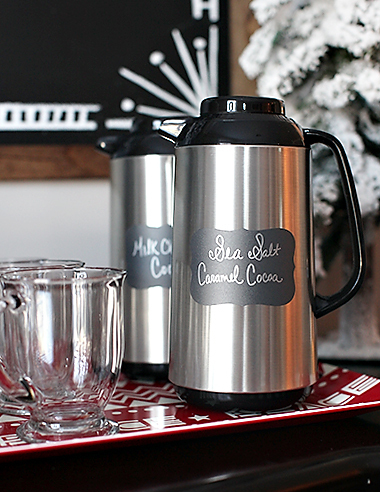 Choose your top 3 favorite varieties for the hot cocoa bar and use labeled insulated containers to keep your hot cocoa exactly the way you want it—hot! Your cup of cocoa is like an artist’s blank canvas—full of possibilities and ready to be turned into a masterpiece! Toppings are the best part of a cocoa bar because you get to dress up and customize your hot chocolate according to your taste buds’ every desire. Keep it classic with whipped cream, chocolate shavings, and marshmallows, or spruce it up with candy canes, sprinkles, crumbled cookies, candy bits, and more! Fill shakers with powdered sugar, flaky sea salt, nutmeg, and other spices for a lovely dusting across the top of your concoction. Use festive bowls, vases, and cups to display your toppings with Christmas cheer. Don’t forget to label each topping accordingly and make sure each topping has a serving spoon if necessary. Leave the boring straws and wooden stirrers at your office coffee station. 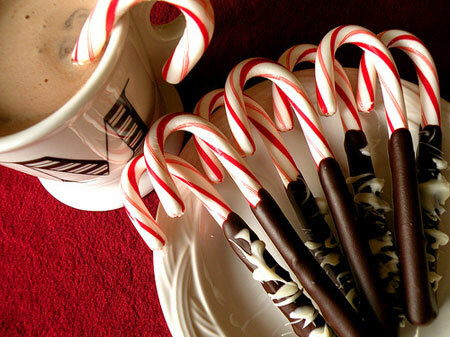 This holiday, mix it up with fun, flavorful stirrers for your dream cup of hot cocoa. Candy canes, cinnamon sticks, chocolate covered pretzel sticks, and wafer cookies are all sweet edible options that double as a bonus treat! If you feel up to another DIY project, create your own edible stirrers. 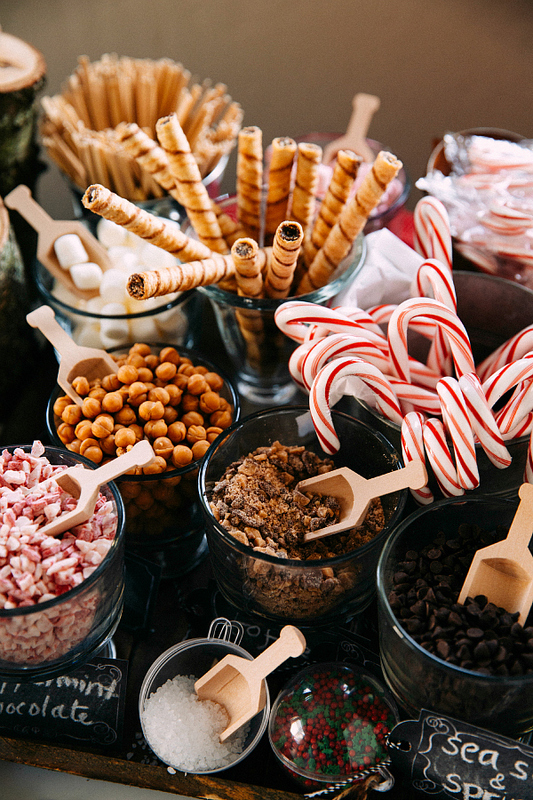 Christmas chocolate spoons, Marshmallow Snowmen, and chocolate dipped peppermint sticks are all tasty ways to mix up your cocoa bar creation, too! Do you have a mug that just speaks to your soul? Everyone loves a good mug, and it seems like everyone has their own personal favorite. Mugs showcase our humor, interests, and individuality, so why not show them off? Invite your guests to B.Y.O.M. (Bring Your Own Mug) to your hot chocolate bar. It’s fun to see everyone’s unique mugs and hear the surprising stories behind each one and you won’t have to worry about anyone mixing up their drinks! On top of it all, there’s less dishes to clean for the hosts! It’s all in the details. 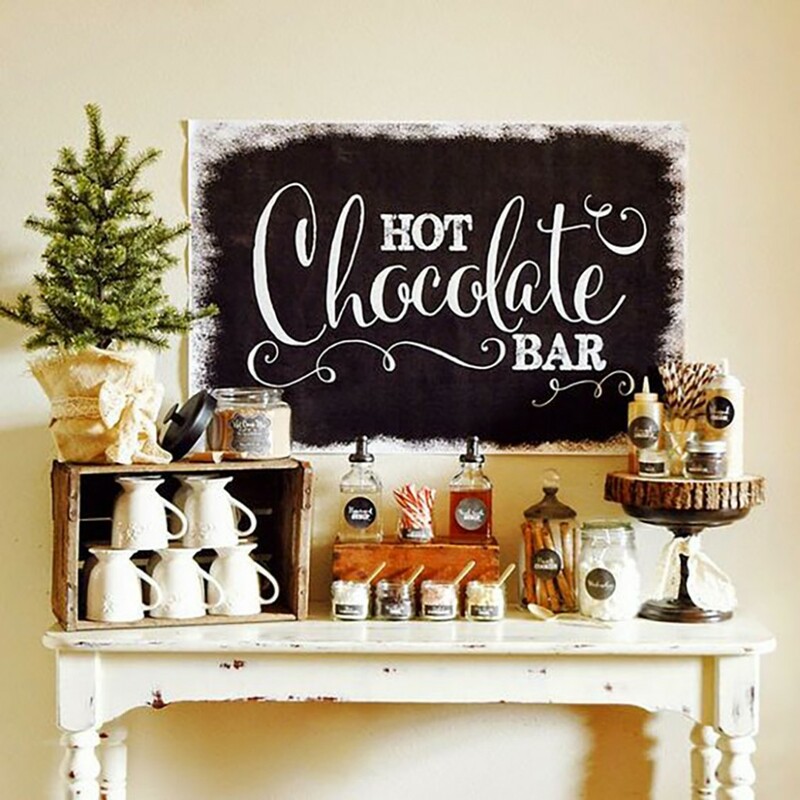 Keep your guests talking about your hot cocoa bar well into the New Year by adding cute, festive decorations and personal touches. Whether that means strewing Hershey’s Kisses across the table, making hand-written tent cards, or carefully placing ornaments in a pretty vase, let your inner-Pinterester run wild. Now that your hot cocoa bar is ready, it’s time to enjoy the fruits (or should we say, treats) of your labor! Take the family out for an evening stroll, bringing your cocoa along to keep you warm along the way. Visit the Christmas Tree on the Pismo Beach Pier, stroll down the Avila Beach Promenade watching the lights reflect off the water, or visit the Paso Robles Inn on Christmas day for a delicious buffet. Wherever you go, you’re always welcome to visit our hotel lobbies for a hot cocoa refill at our own hot chocolate bars. From all of us at Martin Resorts, Happy Holidays and warm wishes for the New Year!